Lake Gaston . . . one of the truly superior lakes in the country is a boater's paradise! It is approximately 1.3 miles across at its widest point, over 20,000 acres, 34 miles long and has 350 miles of beautiful shoreline with breathtaking views! Located along the North Carolina & Virginia border, Lake Gaston begins at Kerr Dam, a lake built in 1953 for flood control. Below Lake Gaston is Roanoke Rapids Lake, a smaller lake built in 1955 for hydroelectric power. Gaston Dam completed in 1963 borders the counties of Mecklenburg and Brunswick in Virginia and the counties of Warren, Halifax and Northampton in North Carolina. Constant water level--normal height of the water is 200 feet above sea level and by regulation the water depth may vary only one foot plus or minus from the normal level except in case of emergency. With no pollution, the water is almost drinkable without treatment—perfect for swimming, boating and fishing and rated A-2 by the NC Stream Sanitation Commission. All boats must be licensed in any state and proper safety equipment must be aboard for all passengers. Safety and safety equipment are vigorously policed. Three public ramps in Virginia and three in North Carolina provide access. There are no restrictions on boats or motors, however drivers of power driven boats must be at least 14 years of age in Virginia waters. Lake Gaston is well stocked with game fish which include striped bass or rockfish, large mouth bass, crappie, sunfish and several varieties of catfish. Other species of fish sometimes caught are walleye, yellow perch and chain pickerel. A valid license in either Virginia or North Carolina permits fishing from a boat or the shore in both states. No license is required for those under 15. Hunting for many species of game is also prevalent in many areas near the lake. There are over 200 subdivisions around the lake where many own retirement homes and many others own homes for weekends or vacations. Many vacation rental homes are also available. 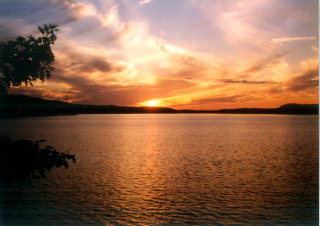 There are a few campgrounds and a minimum of public facilities on the lake. Golfers will find several golf course communities nearby. New property owners have a choice of lake access or lakefront property with expansive views of the water—some with sunrise or sunset views, cove or main lake. Since most lake area lots are from one half acre up in size and woods are prevalent, lake house privacy is abundant. There IS a lake community designed to fit your needs. Invest in you and your family. Invest in making memories. Invest in beautiful Lake Gaston! Give us a call and explore the possibilities waiting for you.